This year we’re all going nuts for this fabulous puff pastry Christmas tree which is not only really easy to make, but looks and tastes sublime. 2. Cut the block of pastry in half, then roll out two sheets to 28cmx33cm on a lightly floured surface. Try to make sure that the sheets are about the same size. Lay the first sheet out on the prepared baking tray. 3. 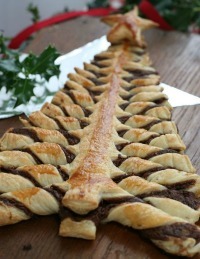 Very gently, score a rough shape of a Christmas tree (triangle) with a knife, just so that when you spread over the Nutella®, you have a guide for where the tree will be. Try to maximise the space and leave the base of the triangle as wide as possible, and leaving a little space for a star at the top. 4. With the back of a spoon, spread the Nutella® thinly in the triangle area. 5. You should end up with a chocolate triangle. 6. Roll the second sheet of puff pastry up then place at the top of the bottom layer, ready to roll it down towards you. 7. Gently with your fingers try to feel the outline of where the chocolate is underneath. Score along the lines of the triangle first with a knife then begin cutting carefully. I pressed the blade into the pastry rather than sliced so that I did not tear the foil. Remove the excess pastry. 8. At the base of the tree carefully cut away two strips either side to form the base of the tree trunk. 9. Very lightly, score where the trunk of the tree will be as a guide, wider at the base, getting thinner at the top. Pressing the knife blade rather than slicing, begin cutting the pastry to form the branches, following the line of the trunk and getting narrower the further up they go. 10. Finally the tree will be ready for twisting! 11. Beginning at the base, twist the pastry away from you, trying to get in two turns on the lower branches. 12. Continue moving up the tree, twisting away from you as you go. 13. At the top of the tree you may only get a single twist in the top branches. 14. If desired, cut out a star with the trimmed pastry and place on the baking tray. Brush the star and tree with lightly beaten egg. 15. Bake in the preheated oven for 12 to 15 minutes, or until risen and golden brown. If you want to serve right away, allow to cool for a few minutes then slide a piece of baking parchment underneath to use to lift and transfer to a serving plate, or slide off if firm enough. 16. Once cool, dust with little icing sugar if desired. With thanks to www.allrecipes.co.uk for sharing the recipe!